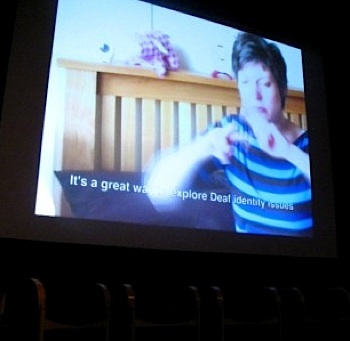 Last month saw me pitching for the 2010 Ben Steiner Bursary - a sum of £5000 awarded to a Deaf film-maker to make a 15-minute film in time for Deaffest 2011 at Wolverhampton's Lighthouse. Aside from pitching to a judging panel of four, Dragon's Den-style, in an unusual twist we had to present our pitches as a 5-minute subtitled film instead of doing it live. The reason? A live audience would be watching that and the judges' interviews afterwards. Scary! Obviously people were worried about intellectual property. We were, after all, presenting ideas that might never make it to film - but I did draw some comfort from the sight of visitors signing confidentiality agreements on the day. It was a blazing May afternoon. We all felt the white heat coming from the Lighthouse's courtyard glass roof - and I was nervous. I'd never done a pitch before, so risked looking like a fool. Competition was strong. Amongst those competing for the bursary were Charlie Swinbourne and Ted Evans (he of the brilliantly-executed drama G.A.). I once caught a Deaf director jabbing his folded copy of the festival programme at another contestant in what looked like a pep talk. Five thousand quid: a lot, and yet not a lot. Everyone seemed to be doing the tentative dance of boxers beginning their bout - even though we were wishing each other good luck. I didn’t know what to expect. When my turn came it felt bizarre; answering questions on the hoof while keeping my body turned towards the audience, as if I was acting. Of course I fluffed – many times. Looking back I can’t believe I told one judge I’d never worked with actors before when I'd actually collaborated with Daniel Craig at the National Youth Theatre! I wasn’t alone. I felt for one contestant who confidently declared that he wanted to make his film in India, only to dig himself in an ever-deepening hole when asked why he couldn’t emulate Indian Deaf Culture here in the UK. Another refused to outline his story in public (clearly, Deaffest's co-ordinator hadn't managed to alleviate his fears).